You can imagine Lord Melchizedek as the President of our Universe, overseeing the ascension of all beings within this Universe. He was also referred to King of Salem, Priest of Most High God Melchizedek in the Bible (Scripture, Psalm 110). Melchizedek overshadowed the Jewish prophet Enoch until the latter achieved ascension. This morning, Lord Melchizedek spoke to me about the importance of anchoring Christ Consciousness onto Earth. Channeled: The etheric body of the human contains a Tree of Life mapped to the seven basic chakras (Ann’s note: see diagram on the left). The seed of Christ Consciousness grows from the heart chakra and blossoms into the upper chakras as an initiate awakens to his Love consciousness. 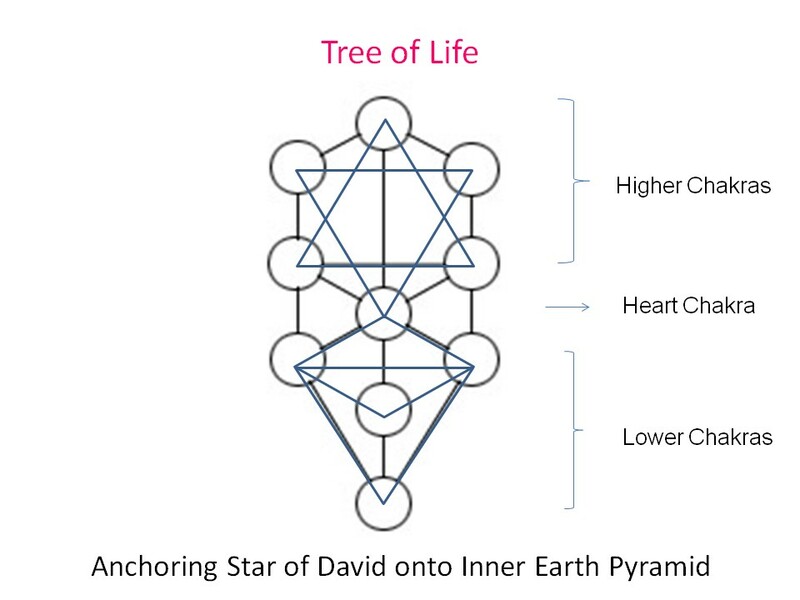 A Star of David formed by connecting the first 6 Sephiroth of the Tree of Life and symbolic of a fully expanded Christ consciousness, is then anchored onto the upper chakras. This is the transformation in consciousness that is occurring to many spiritual aspirants right now. To propel humanity towards mass awakening of the Christ Consciousness, it is important that you, dear seekers of Light and Truth, consciously root your Star of David into the Inner Earth Pyramid through your lower chakras. This can be done by visualising the Star of David moving down the lower half of your body and sinking into the Earth’s core. By doing so, you are increasing the collective Love quotient co-owned by mankind, an energy essential for achieving mass ascension of the heart. I am Lord Melchizedek, embodying this Universe which you are part of. With this new insight, I now have a deeper understanding and appreciation of the need to frequently ground our body and connect with Mother Earth. Blessings, Ann.